Chomping down on alt-meat in the form of the iconic hamburger: What is this new trend of alternative meat, produced without killing animals? What exactly is meat? Etymologically, the word comes from Old English mete, signifying food. Culturally, the term is associated with edible animal flesh. Nutrition-wise, it’s protein. Chemically speaking, meat is composed of amino acids, fatty acids, carbohydrates, water, minerals, myoglobin… It’s this molecular structure, and by extension the sensory experience that it provokes, that the latest “alt-meat” trend is trying to replicate in the laboratory. These new alternative meats, which reconstitute or simulate meat from a chemical point of view in order to recreate its nutritional and gustatory value, all have one vital advantage: they eliminate animals from the production chain. On a large scale, this would imply not only the end of animal farming, slaughtering and suffering, but also a drastic reduction in water, energy and land resources required to graze cattle and grow the grains to feed them. Not to mention greenhouse gases—cattle produce 15% of global emissions. In short, there are too many cows on the planet. No need to remind us how being vegetarian or vegan benefits the environment. But what if meat itself weren’t necessarily cruel and unsustainable, but rather the way it’s produced? And is it realistic to expect everyone to unilaterally give up eating animals, which Homo Sapiens and our ancestors have been feeding on for the past millions of years? In the United States, land of the iconic hamburger, where meat is a cultural staple but healthy and eco-friendly habits are also on the social agenda, new alternative meats made in a lab from plants are starting to hit the mainstream. On the frontline is lab-engineered ground beef, both in supermarkets and in the restaurants of renowned chefs. The lab burger has become the proof of concept of a future world where meat is produced without killing animals. In San Francisco, we decided to focus our undercover taste test on the most high-profile of plant-based meats widely accessible in restaurants (and for almost the same price as a conventional burger): the Impossible Burger, produced by the start-up Impossible Foods. As the gourmet hamburger experience varies by chef, we selected three restaurants, each specialized in American cuisine, in three different locations around the Bay Area. At Scolari’s at the Point, tucked away in the former military base of Alameda in the East Bay, the Impossible Cheeseburger ($14.50) is discreetly displayed on the menu, written in chalk on a big slate next to the counter. The burger is simple and classic. The thin patty is a bit dry on the inside, but the crispier grilled edges give it a more satisfying texture. It goes down well enough with the cheese and BBQ sauce. Verdict: Edible, but not entirely convincing. At Gott’s, a family-style diner in downtown Walnut Creek, northeast of San Francisco, I ask if I can have my Impossible Cheeseburger ($13) medium rare. The staff regretfully informs me that it’s not possible, that the plant-based meat falls apart if it isn’t cooked all the way through. The Impossible Burger doesn’t taste like real meat, she says, but it’s got a little kick. I’m game. Even well done, this cheeseburger is more moist and chewier than my first. Verdict: Good, but still more of a novelty. At The Counter, a restaurant specialized in gourmet burgers located in a trendy neighborhood of San Jose in the heart of Silicon Valley, I can’t even get a table. I head to the take-out counter. After studying an entire menu of available toppings and recommended combinations, I settle on the Breakfast Burger with an Impossible patty ($16.75). I ask if I can have it medium rare. No problem, replies the staff. She says that the Impossible Burger is a popular choice, and that they usually recommend medium. 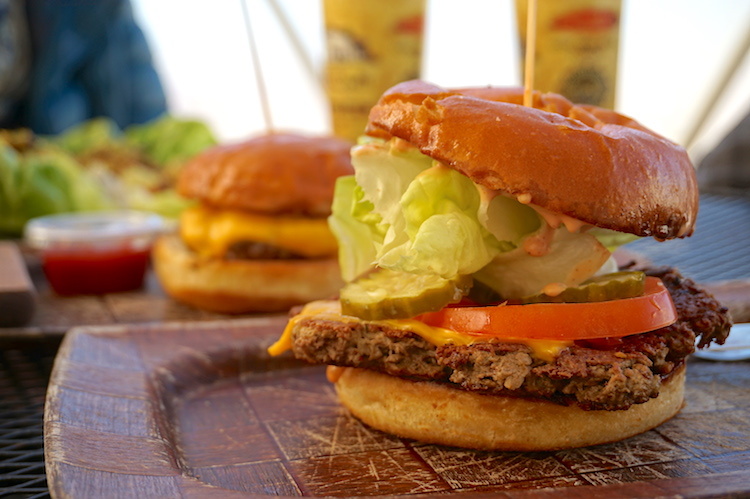 Once I bite into the burger, surprise: the thicker patty allows for more flexibility in preparation, texture and seasoning. The result is a richer, meatier mouthful and a truly gourmet sensation. What does the future hold for synthetic meat? Beyond the burger-tasting, there are two main camps of “new meat”: cellular agriculture (using animal cells) and simulated meat (using plant cells). On one side, plant-based meat, such as the Impossible Burger, have already penetrated the market in grocery stores and restaurants. On the other side, so-called “clean meat”, advanced as a prime application of cellular agriculture, remains more of a promise. Pat Brown, former vegan biochemist at Stanford University, founded Impossible Foods in 2011, with the tagline “The future of meat”. It was during his experiments in the lab that he discovered heme, a hemoprotein that he claims is the key to the “bloody” taste of red meat. 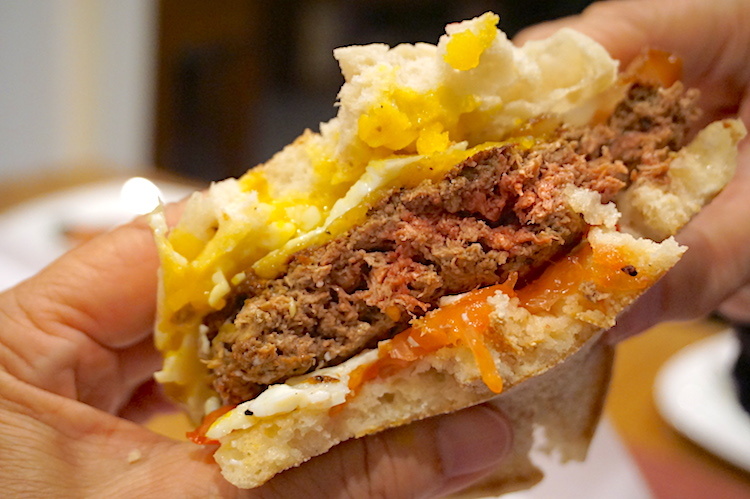 By genetically modifying organisms of soy roots with fermented yeast, the molecular biologists of Impossible Foods reformulate an analogue hemoprotein, which they combine with wheat and potato proteins… Perhaps not surprisingly, these GMO techniques are still facing both official and popular resistance in terms of food safety, despite all of the start-up’s efforts to prove the natural purity of its product. Pat Brown refuses to collaborate with the traditional meat industry, but he has seduced a number of celebrity chefs since launching the Impossible Burger on the market in 2016, including David Chang (Momofuku Nishi), Traci Des Jardins (Jardinière), Tal Ronnen and Chris Cosentino. 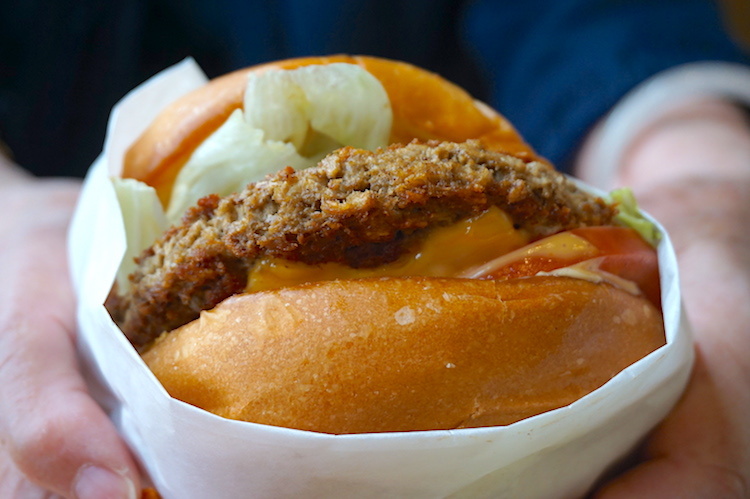 Currently, anyone can order an Impossible Burger in some 500 restaurants across the U.S. (including Fatburger, Umami Burger, White Castle…) and very soon in the restaurants of chefs May Chow and Uwe Opocensky in Hong Kong. Beyond Meat was founded by Ethan Brown, a vegan entrepreneur who spent his childhood vacations in rural America on the dairy farm of his professor father. After working in the renewable energy sector, he launched Beyond Meat in 2009 with the taglines “Eat what you love” and “The future of protein”. Beyond burgers, chicken strips and sausages are engineered in the company’s dedicated Manhattan Beach Lab in Southern California, where pea and soy proteins are heated, cooled and pressurized in order to simulate the structure of animal muscle tissue along with yeast extract, coconut oil, beet juice, etc. Next target: Beyond Bacon. On the other side of the synthetic meat spectrum are the cellular agriculture start-ups: Memphis Meats, Finless Foods and Just in California, Mosa Meat in the Netherlands, SuperMeat and Future Meat Technologies in Israel. There is also Perfect Day for dairy products, The Wild Type for salmon, Wild Earth Pets for pet food… not to mention the Real Vegan Cheese biohackers and the DIY Japanese project Shojinmeat (which we covered here), which fully embraces its sci-fi inspiration. While cultivating animal cells to produce real meat may sound promising, the hype it has generated over the past few years still faces the same problems: scalability, cost, reglementation, dependence on an adapted industrial ecosystem with high energy consumption, substitution of fetal bovine serum with a less cruel and more accessible culture medium… and an always fleeting launch date on the market. Of course, with their millions of dollars in capital funding from Silicon Valley and Big Meat, it’s easy to see through the arrogance of some of these “agripreneurs” who claim their own patented food tech will save the world. And yet, it’s precisely this big money, ecological urgency and constant innovation that will ensure higher visibility and wider distribution of these new food products and manufacturing methods. What if “meat” is a just question of marketing?